The Apparition of Our Lady of Miraculous Medal to St. Catherine Labouré. O Mary! conceived without sin, pray for us who have recourse to thee! When Sister Catherine was favored with these apparitions of the Blessed Virgin she related by word of mouth to her Director, what she had seen and heard, and he, though apparently attaching little importance to her communications, carefully took note of them. The Sister never thought of writing them, she judged herself incapable of doing so, and, moreover, in her opinion, it would have been-contrary to humility. “I then asked the Blessed Virgin for an explanation of what she had already shown me. She answered: ‘My child, the times are very disastrous, great trials are about to come upon France, the throne will be overturned, the entire world will be in confusion by reason of miseries of every kind. (The Blessed Virgin looked very sad in saying this.) But come to the foot of this altar, here graces will be shed upon all – upon all who ask for them with confidence and fervor. “ ‘There will be victims in other Communities.’ (Tears were in the Blessed Virgin’s eyes as she said this.) ‘Among the clergy of Paris there will be victims, Mgr. the Archbishop will die. (At these words her tears flowed anew.) My child, the cross will be despised, it will be trampled under foot, our Lord’s side will be opened anew, the streets will flow with blood, the entire world will be in tribulation.’ ” (Here the Blessed Virgin could no longer speak, grief was depicted in her countenance.) At these words Sister Catherine thought, when will this take place? And an interior light distinctly indicated to her in forty years. Another version, also written by her own hand, says forty years, then ten, after which, peace. In connection with this M. Aladel said to her: “Will you and I see the accomplishment of all these things?” “If we do not, others will,” replied the simple daughter. The Blessed Virgin also entrusted her with several communications for her Director concerning the Daughters of Charity, and told her that he would one day be clothed with the necessary authority for putting them in execution. [M. Aladel was made Director of the Community in 1846.] After this, she said again: “But great troubles will come, the danger will be imminent, yet do not fear, St. Vincent will watch over you, and the protection of God is always here in a particular manner.” (The Blessed Virgin still looked very sad.) “I will be with you myself, I will always keep my eye upon you, and I will enrich you with many graces.” The Sister adds: “Graces will be bestowed, particularly upon all who ask for them, but they must pray, they must pray. In the month of November of this same year, 1830, Sister Catherine communicates to M. Aladel a new vision; but it is no longer that of an afflicted Mother weeping over the evils menacing her children, or the martyrdom of her dearest friends. This vision recalls the rainbow appearing in a sky still black with storms, or the star shining through the tempest to inspire the mariner with confidence it is the Virgin Queen, bearing the promise of benediction, salvation and peace. M. Aladel relates this to the Promoter of the diocese, and we find it inserted in the verbal process of the investigation, dated February 16, 1836, as follows: “At half-past five in the evening, whilst the Sisters were in the chapel taking their meditation, the Blessed Virgin appeared to a young Sister as if in an oval picture; she was standing on a globe, only one-half of which was visible; she was clothed in a white robe and a mantle of shining blue, having her hands covered, as it were, with diamonds, whence emanated luminous rays falling upon the earth, but more abundantly upon one portion of it. Here is the account written by the Sister s own hand: “The 27th of November, 1830, which was a Saturday and eve of the first Sunday in Advent, whilst making my meditation in profound silence, at half-past five in the evening, I seemed to hear on the right hand side of the sanctuary something like the rustling of a silk dress, and, glancing in that direction, I perceived the Blessed Virgin standing near St. Joseph’s picture; her height was medium, and her countenance so beautiful that it would be impossible for me to describe it. She was standing, clothed in a robe the color of auroral light, the style that is usually called à la vierge – that is, high neck and plain sleeves. Her head was covered with a white veil, which descended on each side to her feet. Her hair was smooth on the forehead, and above was a coif ornamented with a little lace and fitting close to the head. Her face was only partially covered, and her feet rested upon a globe, or rather a hemisphere (at least, I saw but half a globe). Her hands were raised about as high as her waist, and she held in a graceful attitude another globe (a figure of the universe). Her eyes were lifted up to Heaven, and her countenance was radiant as she offered the globe to Our Lord. “Suddenly, her fingers were filled with rings and most beautiful precious stones [The ring s were three on each finger; the largest next to the hand, then the medium size, then the smallest; and each ring was covered with precious stones of proportional size; the largest stones emitted the most brilliant rays, the smallest the least brilliant]; the rays gleaming forth and reflected on all sides, enveloped her in such dazzling light that I could see neither her feet nor her robe. The stones were of different sizes, and the rays emanating from them were more or less brilliant in proportion to the size. None of these narrations mention the serpent, yet it always figures in representations of the apparition, and certainly in conformity with Sister Catherine’s earliest revelations of the vision. The following shows why we are so positive of this fact. Towards the close of her life, after a silence of forty-five years, M. Aladel being no more, this good daughter was interiorly constrained to confide to one of her Superiors the communications she had received from the Blessed Virgin, that they might serve to reanimate devotion and gratitude to Mary. Having done this, her mind was relieved; she felt that now she could die in peace. 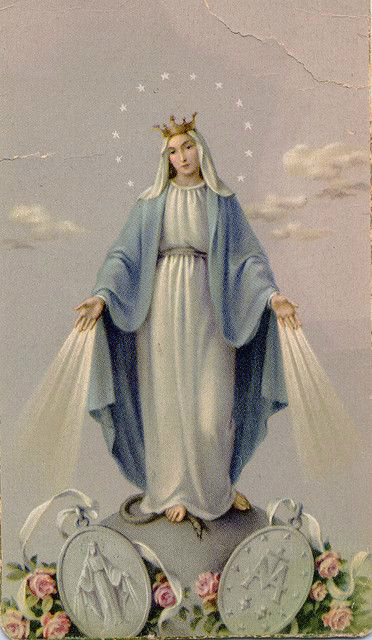 The Superior, favored with her confidence, wishing to realize one of her venerable companion’s most cherished desires, proposes a statue of Mary Immaculate, holding the globe. On asking Sister Catherine if the serpent must be represented under the Blessed Virgin’s feet, she answered: “Yes; there was a serpent of a greenish color, with yellow spots.” She also remarked that the globe in the Virgin’s hands was surmounted by a little cross, that her countenance was neither very youthful nor very joyous, but indicative of gravity mingled with sorrow, that the sorrowful expression vanished as her face became irradiated with love, especially at the moment of her prayer. Our attempt at representing the vision was successful, although the tint of the robe and veil, the celestial radiance of the face, the splendor of the rays, must always remain an impossibility for art; as the good Sister, whilst declaring her satisfaction, betrayed by her tone of voice and expression the disappointment she felt at the impotency of human skill to depict the beauty of the celestial original. Thirty-five years before, M. Aladel had vainly attempted a representation of the same apparition, as we learn from a curious fragment, a small design representing the Immaculate Virgin holding the globe, etc., as described by Sister Catherine. His note directing the details is in exact conformity with the Sister’s description, except in one particular, the blue mantle. But little satisfied with this attempt, which gave but a confused idea of the apparition, and his own especial impression of it, he relinquished the undertaking, and held to the known model. We may say, with truth, that nothing can equal the beauty, the grace, the expression of tenderness depicted in the attitude of this Virgin, whose graciously downcast glances and hands, filled with blessings, proclaim her the Mother, inviting her little child to cast itself into her arms, or earnestly entreating the prodigal son to confide in her merciful mediation. This image of the Immaculate Mother, universally admired and honored, has a mute eloquence which never fails to touch the heart; and, truly, may it ever be styled the miraculous Virgin. Were we to cite only those which have come to our knowledge, a volume would be insufficient to contain an account of all the wonderful conversions, cures, marks of protection, wrought since the appearance of this vision to the present day. The production of new models, representing the Immaculate Virgin in a different attitude, should never supplant this, which is, as it were, the type of all others; nor weaken the devotion heretofore accorded it by popular gratitude. Taken from: The Miraculous Medal – Its Origin, History, Circulation, Results, M. Aladel, C.M., 1880.